This was the horror movie I really wanted to see this summer but totally missed due to how far I live from the nearest movie theater and how much moving costs. I was delighted when my copy from the library came in this past week, I had to get it and watch it. So, over dinner, I watched. And I had to say, this was a fun horror movie. Definitely deserves the good reviews it’s getting. 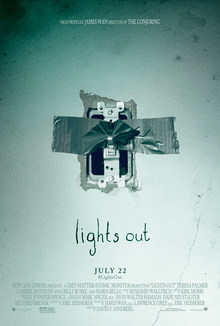 Lights Out is about a young woman who returns to her childhood home after she gets a call about her half-brother falling asleep in class, and their mother can’t be reached. At first the young woman thinks it’s her mother’s mental illness resurfacing, but it soon becomes apparent that the family is being haunted by Diana, a vengeful apparition who met the mother while alive and who draws her power from the darkness. And she’s not about to let any of them go. This movie definitely has a lot going for it. Filmed on less than five million dollars, the film uses almost entirely practical effects, which I love. I especially love the villain Diana, who is scariest when you only see her as a dark silhouette with two glowing blue eyes. The filmmakers knew this too, only showing Diana once out of silhouette, which actually wasn’t that scary. Weirdly enough, I actually felt a lot of sympathy for Diana. I don’t do well in sunlight either, so I understand her aversion to life. I wonder what a character like her would be like as a protagonist. As for the actors, they all give very good performances. The characters are all pretty basic, but the actors take what they’re given and give it their all, making the characters believable and sympathetic. The one exception to this would be the mother character Sophie, but not for the reasons you might think. Of all the characters, Sophie has the best character arc. I won’t give away spoilers, but you do see her go through a transformation as she comes to realize the truth of her ghostly friend. It’s also refreshing to see a character with mental illness shown not as evil or murderous, but as an actual person dealing with an illness and a very tough situation. Obviously, the use of shadow and light in this film is phenomenal, making you feel the dark as menacing and wishing for the light. I also liked the writing, which culminated in an ending that honestly surprised me. Usually I can predict how a story ends, but this time, I was unable to. Very nicely done on the part of the writers. If there are things that could have been improved upon with this film, I would’ve liked to see the protagonist’s earlier experiences with Diana, which are only shown once and never picked up on again (and we get hints that there’s more to that part of the story that we never see, so that makes me mad). There’s also a moment when you can clearly see the actress playing Diana in a black bodysuit, which takes away from the horror of the moment. But that’s about it in terms of complaints. I really wish I could’ve watched this film in the dark of a movie theater, like it was meant to, but unfortunately I watched it in my living room with the lights on, and that really affected my experience with the film. I’m pretty sure I would’ve been more scared if I’d seen it in the dark. Well, hindsight’s 20/20 after all. All in all, I’m giving Lights Out a 4.3 out of 5. It’s scary, fun, and definitely worth a watch in the dark. Just make sure to have a flashlight nearby when you watch, okay? NaNoWriMo update: As of last writing session, I am a little under five-thousand words. Still not very far into Full Circle, but I’m making progress. I don’t think I’ll make fifty-thousand words by the end of the month, but I think fifteen-thousand is a pretty achievable goal. Oh, oh, I want to see this, but I am afraid it will actually scare me for a change, LOL! Call me crazy or old-fashioned Joleene, but isn’t that the point of a horror movie? And it can’t be any scarier than spending a night in a certain house near where you live. Or the next four years, LOL. Lol! Well yeah, a good jump or too, but what I meant was that’s why I skipped the theater because I was afraid I would scream in the theater, lol! I’m definitely watching it at home!